When our service manager, Philip LaPlante, started his career in appliance repair 35 years ago, the job requirements were quite different than they are today. During those years, he called on clients from a truck without air conditioning and he had to borrow a client’s phone or find a pay phone to contact the office or suppliers. 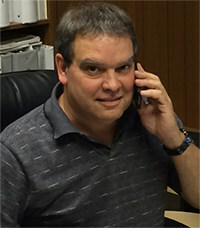 Today, laptops and smart phones are important tools for LaPlante and his team of technicians at C&W Appliance Service Inc. Clients make appointments online or over the phone and both technicians and office staff count on technology to increase their efficiency. But one thing still remains the same. Old-fashioned customer service is still in style around here. Many C&W Appliance Service clients have worked with the company for decades. More than 600,000 records of service calls over the years are kept in electronic files, to be referenced when the need arises. Designed to make our lives easier, appliances are getting more complicated. Some have extensive electronic and digital systems with touch pads, multiple circuit boards and diagnostic systems. Some appliances require a specific cable to plug in for diagnosing problems. Sub-Zero refrigerator repair and Wolf oven repair utilize computerized programs that allow us to review the history of an appliance, including run times and temperatures. Built-in digital diagnostic systems on other equipment can help technicians save time by providing an error code — but they are not foolproof. In addition to morning meetings before their daily rounds, technicians meet every Friday morning to discuss new products or for training. As the only Sub-Zero and Wolf factory-certified premier partner in Dallas, Fort Worth and San Antonio, C&W Appliance Service has a good relationship with Sub-Zero and Wolf and many other manufacturers. Often, they will send over a new product for the staff to become familiar with or technicians will watch an unusual repair in our warehouse. So the next time you schedule an appliance repair appointment, notice that your C&W Appliance Service technician is toting more than a tool box. He’ll have the technological resources to back up his extensive knowledge of appliance repair, and the customer service skills to make it all look easy.